A beetle-sized robot prototype developed by researchers at Ritsumeikan University and the Shiga University of Medical Science in Japan was unveiled this week. The robot is designed to enter the body through a small incision; doctors would then direct its movements. 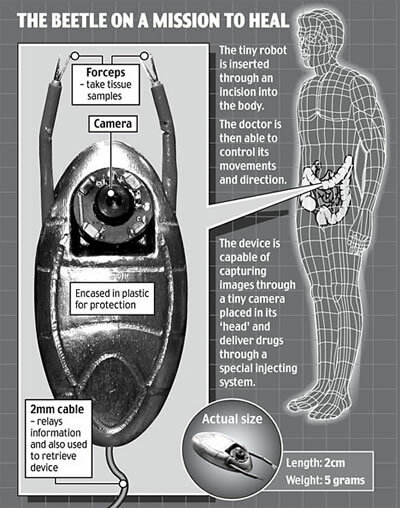 The robot is equipped with a tiny camera in its head; it can even deliver drugs with an injection device. Tiny dual forceps take tissue samples. 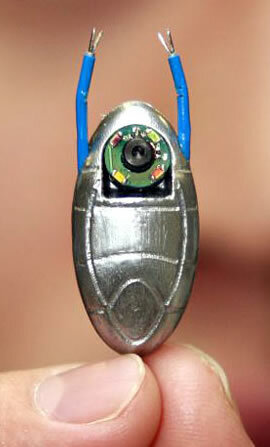 In tests with animals, the robot, which weighs just five grams, performed very well. This robot could even perform procedures while in the body. Alternatively, it could be directed to maneuver from place to place, taking samples looking for the spread of cancer. Science fiction fans doubtless are reminded of the Proteus, the miniaturized ship made famous in the 1966 film Fantastic Voyage. However, this robot is much too large to fit into a blood vessel. A tiny robot that slides on a layer of mucus right on up your intestine. A novel propulsion system for a miniature robot to travel through the spinal canal. Read a bit more at the Mail.